How do public 'report cards' affect physicians' treatment decisions? BOSTON – Public "report cards" on outcomes for patients who have undergone percutaneous coronary intervention (PCI or coronary angiography) were originally developed to increase transparency and improve care, but studies have shown that these reports may inadvertently discourage physicians from offering this lifesaving treatment to patients at high risk for poor outcomes. 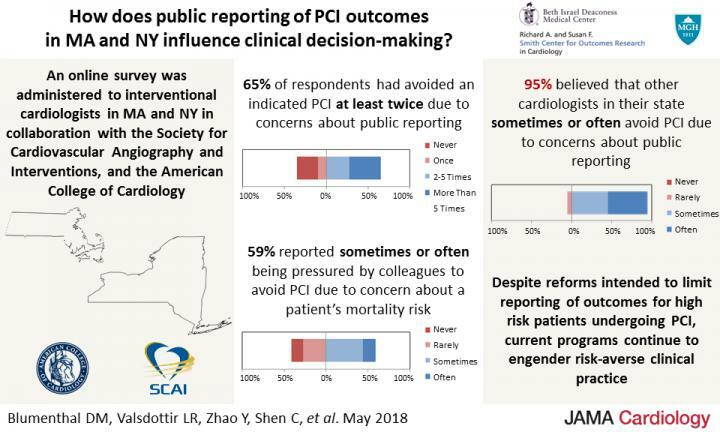 Researchers from the Smith Center for Outcomes Research in Cardiology at Beth Israel Deaconess Medical Center (BIDMC) now provide a closer look at physicians' knowledge, attitudes and beliefs about PCI public reporting. In a study published online today in JAMA Cardiology, the researchers describe the results of a comprehensive survey of interventional cardiologists in two states that mandate public reporting. Their overall results show that risk-averse attitudes and practice patterns remain widespread when clinical results are publicly reported. "Our primary results showed that among the interventional cardiologists who responded, almost two-thirds reported avoiding performing an indicated coronary intervention on at least two occasions due to a concern that an adverse event might negatively affect their publicly reported outcomes," said senior author Robert W. Yeh, MD, MBA, Director of the Smith Center and an interventional cardiologist at BIDMC. "A similar number reported that they had been pressured by colleagues to avoid performing PCIs – even if it was the preferred procedure for the patient's condition – if there was a risk of a bad outcome." The online survey was sent to 456 interventional cardiologists in Massachusetts and New York (where public reporting is mandated). The survey was developed and distributed by the Smith Center in collaboration with the Society for Cardiovascular Angiography and Interventions and the American College of Cardiology's Interventional Council. 95 percent believed that other cardiologists in their state sometimes or often avoid PCI due to concerns about public reporting. "Despite reforms intended to limit reporting of outcomes for the highest-risk patients undergoing PCI, current programs continue to engender risk-averse clinical practice," said the study's first author Daniel Blumenthal, MD, MBA, an investigator in the Smith Center at BIDMC, a cardiologist at the Massachusetts General Hospital and an Instructor in Medicine at Harvard Medical School. "This is the first time we asked interventional cardiologists in multiple states in-depth questions about how these public reports influence their clinical decisions. Their answers revealed that unintended consequences of public reporting continue to undermine the policy." "I think that when developing policies intended to improve quality of care and transparency, policy makers have to talk to the physicians to find out how these policies might change their behavior," added Yeh, who is also an Associate Professor of Medicine at Harvard Medical School. "We need more engagement and input from the people who are actually caring for the patients. While I believe there is an important place for public reporting, we always need to take into account the human factor, which may arise in unexpected ways." In addition to Yeh and Blumenthal, coauthors include Linda R. Valsdottir, MS, Yuansong Zhao, MA, Duane Pinto, MD and Changyu Shen, PhD, of the Smith Center, BIDMC; Jason H. Wasfy, MD, MPhil, and Ken Rosenfield, MD, of Massachusetts General Hospital; Ajay J. Kirtane, MD, SM, of Columbia University Medical Center; Fred S. Resnic, MD, MSc, of Lahey Clinic; Joynt Maddox, MD, MPH of Washington University School of Medicine; and Roxana Mehran, MD, of the Icahn School of Medicine at Mount Sinai. The study was a collaborative endeavor of the Society for Cardiovascular Angiography and Interventions, the American College of Cardiology's Interventional Council, and the Smith Center for Outcomes Research in Cardiology, BIDMC, and was funded through an investigator-initiated research grant from Abiomed, Inc.